As a former smoker, a former heavy smoker, I’m not sure what I would do not being able to smoke when I was at a bar. 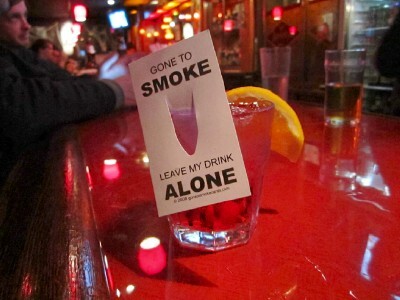 But the law says you can't smoke in bars anymore. This time of year friends are in town for the holidays, everyone meeting at the bars catching up on old times. The bars are packed, at least in my single days they were! If you are a smoker, you crave that cigarette and you go outside to smoke. Seems like a good way to get something slipped in your drink.